NEW! We have added a 3s & 4s program! 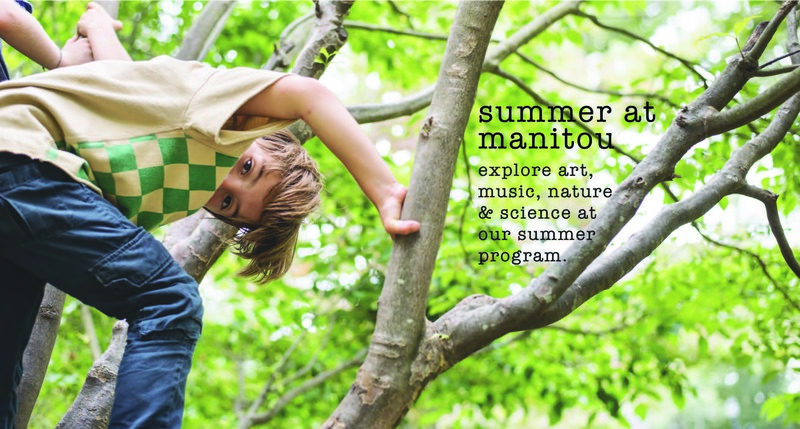 At The Manitou Summer Program children participate in art, music, nature, and science through engaging activities, experiments, STEAM and more! Our program is designed for children to explore creative ideas, build positive relationships, enhance communication skills in a nurturing learning environment. Facilitated by Manitou Staff and community professionals, we use a carefully crafted approach to engage every child. Please find our weekly program descriptions and registration forms below! Our PreK program is designed for 3- and 4- year olds, and will incorporate age-appropriate activities and routines, including naps and rest time for those who need it, as well as fun with water play, sand box time, and more! How many animal creatures and birds live in our local forests? What do their tracks look like? What do they eat? We will learn about the animals around us and will create reflective artwork using techniques such as paper maché. Ages 5-12 taught by Nina Elton Tantillo. Ages 3-4 taught by Yrma Avellaneda. Explore American tall tales, folk songs, game songs and create your own outsider art based on historical cultural traditions. Taught by Terence Murren. Ages 3-4 taught by Yrma Avellaneda. Learn to sing and move to classic Jazz songs from the 1920s-30s, create art inspired by artists from the 1940s-50s such as Jacob Lawrence and Jackson Pollock and compose beatnik poetry from the 1950s-60s. Ages 5-12 taught by Terence Murren. Our younger participants will explore a variety of music using sound-makers to create compositions, explore solos and improvisation. Ages 3-4 taught by Yrma Avellaneda. Explore the rich culture of our Southern neighbors. We will learn traditional songs and create public art and food for our own mini mariachi festival. Ages 5-12 taught by Terence Murren. Ages 3-4 taught by Yrma Avellaneda. Explore self-expression and self-portraiture through songs, art and theatrical role playing. Ages 5-12 taught by Terence Murren. Ages 3-4 taught by Yrma Avellaneda. Calling all architects and builders! Explore architecture through the lens of geometry. We will focus on designing and building our own imaginary constructions using wood, clay, and other found objects. Ages 5-12 taught by Nina Elton Tantillo. Ages 3-4 taught by Yrma Avellaneda. Explore the legends and myths of the Hudson River. River spirits, Revolutionary soldier, Native Americans, Explorers, and Fairies will come alive as well their stories through paint, pastels, pencils, and clay. Age taught by Nina Elton Tantillo. Ages 3-4 taught by Yrma Avellaneda. Please complete the below forms and email them to summer@manitouschool.org. You may also drop off or mail your registration and forms to 1656 Route 9D, Cold Spring, NY 10516. Payments accepted: Check, cash, and Venmo. The C.I.T Program is designed to empower our local youth with tools and skills that will help them grow as positive contributing members of the world. Participants will engage in activities that will allow them to develop their interpersonal skills, leadership skills, communication skills, and passions for teaching and learning all while taking part in fun and engaging learning activities with children from all over the area! If you love to learn, love to work with children, and try new things, we hope you complete this application and join our team!